Travelers have encountered long waits at airport security checkpoints in Atlanta, Chicago, Dallas and other cities – up to two hours in some places. Embarrassed by exposed security lapses and allegations of misconduct, the Transportation Security Administration now faces mounting pressure from airlines for security delays plaguing airports across the country. Tuesday’s terrorist attacks in Brussels spotlighted the havoc that can be wrought on an airport without an attacker crossing through security lines. Even before the attack, security experts had warned about the risks of the snaking lines at checkpoints and ticket counters – known as the vulnerable “soft side” of the airport. The agency renewed focus on screening passengers after undercover auditors slipped hidden explosives past checkpoints last year. As a result, lines have grown during this spring break travel season and are expected to worsen during the peak summer travel time. Travelers have encountered long waits at checkpoints in Atlanta, Chicago, Dallas, Los Angeles, Miami and Newark, New Jersey, among others – up to two hours in some places. Two suicide bombers blew themselves up seconds apart from each other Tuesday morning near check-in counters at Brussels Airport, killing at least 11 people, according to news reports. A third bomb exploded shortly after at a downtown Brussels subway station, leaving a total of at least 31 dead and 300 injured. The Islamic State claimed responsibility. “Obviously, what happened in Brussels underscores the urgency to fix the security line problem,” said Kip Hawley, who was the TSA administrator from 2005 to 2009, adding that long waits pose an unacceptable security risk as passengers get packed into tight screening lines. A confluence of factors – policy shifts, management issues and sunken morale – has many current and former officials concerned that the counterterrorism agency’s internal woes have spilled into public view, manifesting in the long lines. Kenneth Kasprisin, a former acting TSA administrator, said the agency’s culture doesn’t give supervisors the authority or incentive to solve the problems. TSA officials already are getting squeezed by Congress as the embattled agency struggles to strike a balance between aviation security and getting passengers to their flights on time. The agency also is juggling a host of internal issues that have drawn glares from lawmakers, congressional investigators and its own employees. Frustrated passengers have taken to social media to voice their disapproval of the interminable lines. Airlines executives have been irate that the TSA appears to have no plan to address the problem and has consulted little with industry officials. Airlines officials have met repeatedly with TSA officials in recent weeks but are baffled that they have been asked to offer little input on how to reduce wait times. United Airlines has been warning its passengers to arrive hours ahead of scheduled departures to make their flights. Last week was the worst this year for missed American Airlines flights, with 6,800 passengers at the top 20 airports who did not arrive at the gate on time, Feinstein said. In Miami, passengers this month got separated from nearly 3,500 checked bags because of missed flights resulting from TSA baggage screening delays. In February, the general manager of Atlanta’s Hartsfield-Jackson International Airport told TSA Administrator Peter Neffenger that he was considering replacing the agency’s security screeners with private contractors at the world’s busiest airport. And this week, airport authorities in Minneapolis announced that they plan to formally explore using private contractors. Perry Flint, a spokesman for the International Air Transport Association, the industry’s largest trade group and lobbyist, said air travelers should not be subject to one- and two-hour waits at TSA checkpoints. He said it is an urgent and growing concern that has the airlines anxious to learn how the TSA plans to handle the problem with the high travel season ahead. TSA and homeland security officials have said the agency has refocused its mission on security after a leaked classified audit found that it had a 95 percent failure rate in finding fake explosives and other weapons during covert testing last year. After reviewing the agency’s policies, TSA officials determined that they had overemphasized efficiency, among other issues, that caused the security failings. Record travel, a renewed focus on security and shifting threats have contributed to the growing lines, Neffenger told lawmakers this month. The TSA, which through attrition and systematic reductions has cut its front-line employees by about 5,600 over the last five years, now is pushing recent hires through a new training academy launched in January. Although the agency is ramping up hiring ahead of the summer months, Neffenger testified that he expects to see wait times increase. “We were actually moving people very effectively through the system, but we weren’t doing our job well. So you had to do the job well, and that increased wait times by definition,” he said. 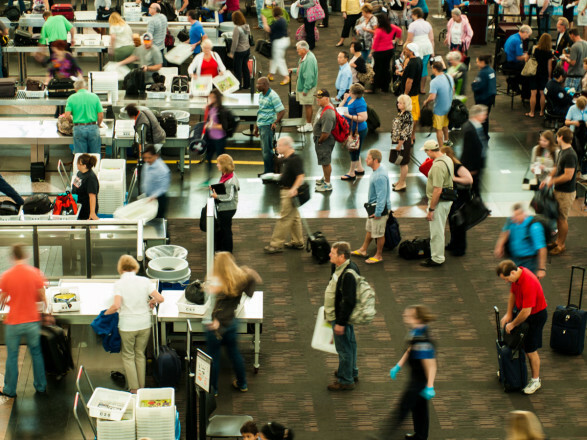 Over the last three years, the TSA also has seen its staffing budget for screeners fall. The agency wants to raise more than $900 million by reinstating a traveler fee of $2 per round-trip ticket. Lawmakers rebuked the idea, calling the tactic a budget gimmick. Neffenger said that without the $900 million, the TSA would lose an additional 13,000 security officers. In a written statement, the agency said security has improved, but it can’t control some matters, such as airport capacity and layout. It called on airlines, airports and the public to do more to reduce wait times. Passengers can arrive up to two hours before flights or enroll in a prescreening program that puts them through expedited screening. But airline executives and travelers say that even those lines have become congested. Airline executives don’t agree with the dwindling staff or budget explanation either, according to Airlines for America, another trade group. “We believe that TSA has adequate funding and staffing to effectively address this issue,” said spokesman Vaughn Jennings. The airlines bear some responsibility for long checkpoint lines, as their checked baggage fees have led to more carry-on luggage, but staffing levels are not the problem, said Hawley, the former TSA administrator. That has not been the experience for some within the TSA. Outside investigators are looking at allegations that agency leaders have retaliated against whistleblowers. In a joint interview last week, whistleblowers Heather Callahan Chuck and Sharlene Mata said the TSA’s practice of unnecessarily reassigning senior managers such as themselves around the country has depleted the number of seasoned security directors who could address the security line issue. Douglas Kidd, executive director of the National Association of Airlines Passengers, which advocates for traveler’s rights and safety, said the TSA has shown little remorse for missed flights and long lines.